From 1907 to 1911, the U.S. Government sponsored the Galveston Movement, a massive effort to direct arriving Jewish immigrants away from New York City and other East Coast ports, all overcrowded with immigrants and their families, and bring them to cities on the Gulf of Mexico, primarily Galveston, Texas. The government wanted to populate the Southern and Western states with immigrants as well as the Atlantic Seaboard. At first, it worked. Nearly 1,000 immigrants, mostly Jewish people fleeing from the pogroms of Russia at that time, moved to the Galveston area and were gradually assimilated into the city and its suburbs. The movement had problems, though. Jews refused to work on Saturday, annoying their employers. There was some anti-Semitism. Low paid Texas workers complained that the Jews took their jobs. There was not a big Jewish community in Galveston to embrace newly arrived Jews, as there was in cities like New York. The new arrivals encountered many of the same problems that confront Jewish, and other, immigrants today. The movement shut down in 1912. Among those Jews who did move to Galveston was Russian Haskell Harelik, who spent his life there. His story is now being told by his grandson, playwright Mark Harelik, The Immigrant. It is a heartwarming, engaging and thoroughly lovable story not just about the Jews, but the Texans who befriended them and, like so many Americans, helped them to become Americans themselves. The play just opened at the George Street Playhouse, in New Brunswick, N.J. The play starts with the impressive display of dozens of huge black and white photos of the Galveston immigrants and what their lives were like in those years. Black and white pictures appear from time to time in the play, just the right times, too, to help tell the story. As the play actually starts, we meet Haskell Harelik. Harelik, a charming, affable young man, arrived in Galveston by ship in 1909, leaving his parents behind in Russia. He had nothing. 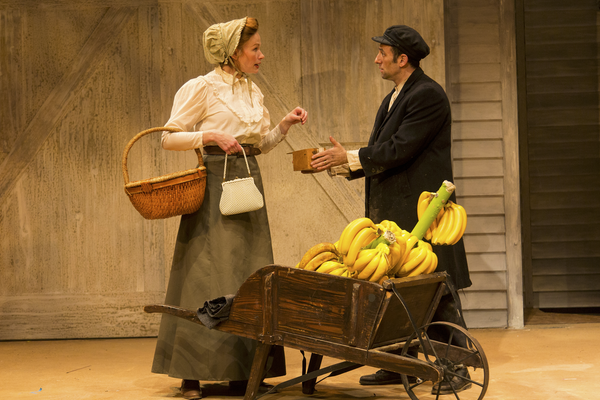 Milton and Ima Perry, a Galveston couple, take him in, renting him a room in their house and get him to start a banana sales business, that he runs out of an old wooden cart. Young Harelik, a hard worker, soon evolves the banana trade into a produce store and then a larger dry goods store. His wife arrives from Russia to join him and they have three children. They become patriotic Americans and his three sons all fight for the U.S. in World War II. Harelik has his struggles, though. Angry residents of a nearby town shoot at him when he visits there with his banana cart. Others scorn him. Many ignore him. Eventually, though, he succeeds. Playwright Harelik does not just tell his grandfather’s personal story in The Immigrant; he tells the story, in one way or another of all immigrants. They all faced the same difficulties upon arrival in America and, in some way, overcame their problems and were assimilated. This is a story triumph, not just for Harelik, but all the immigrants who came to America over all the years. It is a reminder, too, to those on both sides of immigration wars today, that the entry of foreigners int America, however they got here, was always controversial. There are wonderful scenes in the play, such as those when a thrilled Harelik carries his newborn babies out of his house and lays them on the ground so that they become part of America. Then, years later, he names his baby after his friend Milt, and Milt happily carries him out of the house and lays him on the ground. There is the story of the first Shabbat, a Jewish Holy Day, when Haskell and his wife invite Milt and his adorable wife Ima to their home. It is the story of Milt and Ima Perry, too. One of their two children died quite young and the other ran away from home and was rarely heard from. They battle each other, and the Hareliks, and townspeople, from time to time, like we all do. Their story is the story of Texans, and Americans, embracing, with problems, these new immigrants. The play succeeds, mostly, because of the mesmerizing acting of Benjamin Pelteson as Haskell. He is funny, he is sad, he is exuberant. You cheer for him and cry for him. Director Jim Jack, who did superb work on the drama, also gets outstanding performances from R. Ward Duffy as Milt, Gretchen Hall as Milt’s wife Ima, and Lauriel Friedman as Haskell’s wife Leah. There are some gaps on the play. We don’t know if Harelik spoke English when he arrived in Galveston or whether he learned it here. We know very little about the story of his wife Leah or troubles his kids might have had in school. All of that, of course, would require a 450 hour play. The drama in this one is good enough. Haskell and his family were assimilated into Galveston life, his business did succeed and they made friends. It was an American dream for them. PRODUCTION: The play is produced by the George Street Playhouse. Scenic Design: Jason Simms, Costumes: Asta Bennie Hostetter, Lighting: Christopher J. Bailey, Sound: Christopher Peifer, Projection Design: Kate Hevner. The play is directed by Jim Jack. It runs through April 7.